‘Ego’ or vape pen style e cigarettes are a popular vaping choice for those seeking a ‘mouth-to-lung’ vape. This is where you inhale vapour into your mouth before then inhaling into your lungs, similar to how one would smoke a cigarette. The OK Ego Vape Pen kit is our best-selling e cigarette with a standard, above-ohm clearomizer, enjoyed by thousands of vapers. One of the safety features of the OK Ego Vape Pen is the lock feature, which stops the battery being activated when it’s not in use. 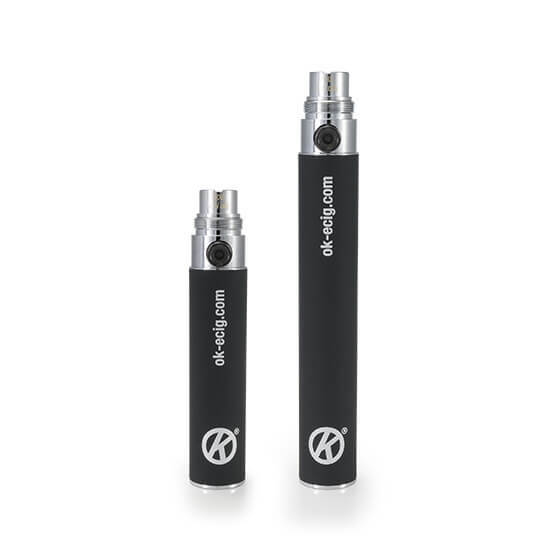 To unlock or lock an OK Ego Vape Pen battery, simply press the button 5 times in quick succession. The blue LED on the battery’s button will flash 3 times to indicate that it has been locked or unlocked. You have checked to see if the battery is unlocked and that hasn’t worked, the next thing to check is the charger. If the charger is working properly, the small LED will glow red if the vape battery is charging or green if the vape battery is fully charged. If the charger’s LED doesn’t light up at all when the battery is attached, it may be that there is a problem with the USB port/power source you have connected it to. We suggest trying it in a different USB port or power source. Very occasionally you may find that a vape battery or charger is faulty. If the above steps don’t work for you, please return your battery back to us along with its charger and a note to explain the issue / fault. If you have any further questions, please do not hesitate to get in touch with our friendly customer service team. You can also find other helpful tips and advice in the OK E Cigarette Information Hub.